Languedoc-Roussillon ([lɑ̃ɡdɔk ʁusijɔ̃]; Occitan: Lengadòc-Rosselhon; Catalan: Llenguadoc-Rosselló) is a former administrative region of France. Since 1 January 2016, it is part of the new region Occitanie. It comprises five departments, and borders the other French regions of Provence-Alpes-Côte d'Azur, Rhône-Alpes, Auvergne, Midi-Pyrénées on the one side, and Spain, Andorra and the Mediterranean Sea on the other side. It is the southernmost region of mainland France. The first part of the name of the province of Languedoc-Roussillon is the French language words "langue d'oc", literally "language of oc". In southern France the word for "yes" was the Occitan language word "oc". Prior to the 16th century, the central area of France was referred to as Languedoil, there the word for "yes" was "oil" in Old French, later becoming "oui". These old place names referred to the areas where Occitan was spoken, and Old French was spoken The Edict of Villers-Cotterets made French the official national language in 1539. Roussillon was the name of the medieval County of Roussillon. 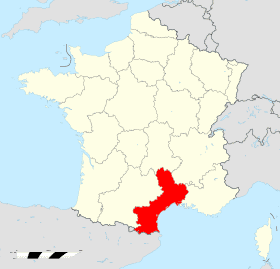 68.7% of Languedoc-Roussillon was formerly part the province of Languedoc: the departments of Hérault, Gard, Aude, the extreme south and extreme east of Lozère, and the extreme north of Pyrénées-Orientales. The former province of Languedoc also extends over what is now the Midi-Pyrénées region, including the old capital of Languedoc Toulouse. 17.9% of Languedoc-Roussillon was formerly the province of Gévaudan, now the department of Lozère. A small part of the former Gévaudan lies inside the current Auvergne region. Gévaudan is often considered to be a sub-province inside the province of Languedoc, in which case Languedoc would account for 86.6% of Languedoc-Roussillon. 13.4% of Languedoc-Roussillon, located in the southernmost part of the region, is a collection of five historical Catalan pays, from east to west: Roussillon, Vallespir, Conflent, Capcir, and Cerdagne, all of which are now part of the department of Pyrénées-Orientales. These pays were part of the Ancien Régime province of Roussillon, owning its name to the largest and most populous of the five pays, Roussillon. "Province of Roussillon and adjacent lands of Cerdagne" was indeed the name that was officially used after the area became French in 1659, based on the historical division of the five pays between the county of Roussillon (Roussillon and Vallespir) and the county of Cerdagne (Cerdagne, Capcir, and Conflent). Llívia is a town of Cerdanya, province of Girona, Catalonia, Spain, that forms a Spanish exclave surrounded by French territory (department of Pyrénées-Orientales). At the regional elections in March 2004, the socialist mayor of Montpellier Georges Frêche, defeated its center-right president. Since then, Georges Frêche has embarked on a complete overhaul of the region and its institutions. The flag of the region, which displayed the cross of Languedoc as well as the Flag of Roussillon (the "Senyera"), was changed for a new flag with no reference to the old provinces, except in terms of the colors (red and yellow), which are the colors of both Languedoc and all the territories from the former Crown of Aragon. Georges Frêche also wanted to change the name of the region, wishing to erase its duality (Languedoc vs. Roussillon) and strengthen its unity. Thus, he wanted to rename the region "Septimanie" (Septimania). Septimania was the name created by the Romans at the end of the Roman Empire for the coastal area corresponding quite well to present day Languedoc-Roussillon (including Roussillon, but not including Gévaudan), and used in the early Middle Ages for the area. This name, however, has not been in use since the 9th century, and it sounded quite odd to French people. Strong opposition of the population led to Georges Frêche giving up on his idea. He declared that he still believed in it but could not go ahead without a mandate. Catalan nationalists in Roussillon would like the Pyrénées-Orientales department to secede from Languedoc-Roussillon and become a region in its own right, under the proposed name of "Catalunya Nord" (Northern Catalonia), as part of the Països Catalans (Catalan Countries), a new country. This idea has minimal popular support. 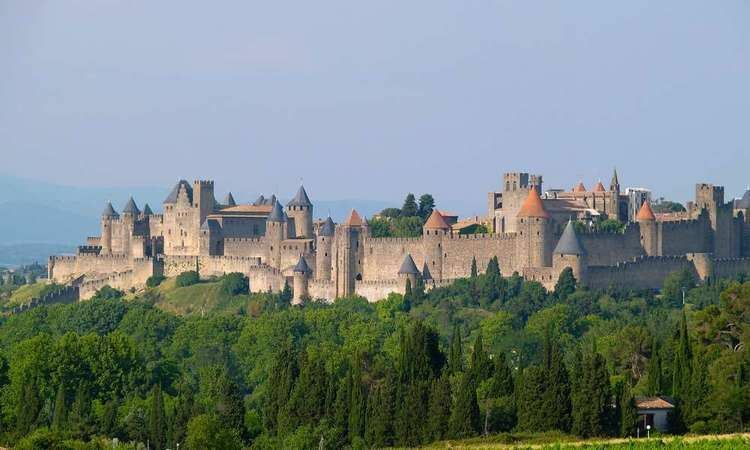 On the other hand, there are some who would like to merge the Languedoc-Roussillon and Midi-Pyrénées regions, thus reunifying the old province of Languedoc, and creating a large region. It seems probable that Georges Frêche, with his idea of a "Septimanie" region, would not support such plans, although political leaders in Béziers, Narbonne, and especially Nîmes, would probably support such a merger, hostile as they are to Montpellier, which was chosen as the capital of Languedoc-Roussillon instead of their own city, and which they accuse of hegemony. Prior to the 20th century, Occitan was the language spoken in Languedoc, and Catalan was the language spoken in Roussillon. Both have been under pressure from French. In 2004, research conducted by the Government of Catalonia showed that 65% of adults over the age of 15 in Roussilon could understand Catalan whereas 37% stated they were able to speak it. In recent years there have been attempts at reviving of both languages, including Catalan-medium schooling through the La Bressola schools. Occitan literature — still sometimes called Provençal literature — is a body of texts written in Occitan in what is nowadays the South of France. It originated in the poetry of the eleventh- and twelfth- century troubadours, and inspired the rise of vernacular literature throughout medieval Europe. Aimeric de Peguilhan, Giraut de Bornelh and Bertran de Born were major influences in troubadour composition, in the High Middle Ages. The troubadour tradition is considered to have originated in the region. The Romantic music composer Déodat de Séverac was born in the region, and, following his schooling in Paris, returned to the region to compose. He sought to incorporate the music indigenous to the area in his compositions. The Languedoc-Roussillon region is dominated by 740,300 acres (2,996 km2) of vineyards, three times the combined area of the vineyards in Bordeaux and the region has been an important winemaking centre for several centuries. Grapevines are said to have existed in the South of France since the Pliocene period - before the existence of Homo sapiens. The first vineyards of Gaul developed around two towns: Béziers and Narbonne. The Mediterranean climate and plentiful land with soil ranging from rocky sand to thick clay was very suitable for the production of wine, and it is estimated that one in ten bottles of the world's wine was produced in this region during the 20th century (Robinson 1999:395). Despite this enormous quantity, the area's significance was often overlooked by scholarly publications and commercial journals, largely because very little of the wine being produced was classified under an appellation contrôlée until the 1980s (Joseph 2005:190). Several entrepreneurs such as Robert Skalli and James Herrick drastically changed the face of the region, planting more commercially viable grape varieties and pushing for new AOC classifications. While the AOC system has origins in the 15th century, the Languedoc-Roussillon has some appellations like the Cabardès which have existed by law only since 1999 (Joseph 2005:190). The region is the largest contributor to the European Union's glut (dominance of supply over demand) of wine known as the wine lake. 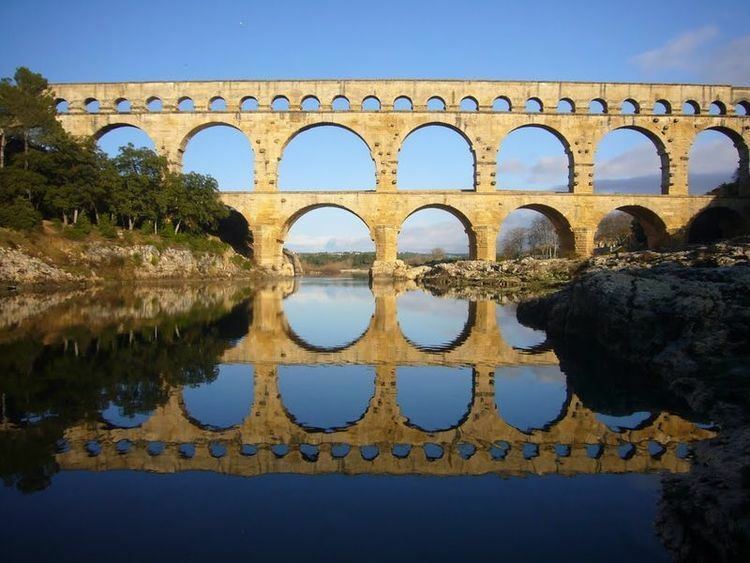 The Languedoc-Roussillon region has adopted a marque to help market its products, in particular, but not limited to, wine. The 'Sud de France' (Southern France) marque was adopted in 2006 to help customers abroad not familiar with the Appellation system to recognise those wines that originated in the L-R area, but the marque is also used for other products, including cheeses, olive oils and pies. Languedoc-Roussillon has been a major centre of Rugby league in France since the sport was introduced to the country in the 1930s. The region is also home of the rugby union teams RC Narbonne and USA Perpignan. Montpellier is home to Montpellier HSC, which was founded in 1974 and plays in the Ligue 1, the French top division. It won the French Championship after the 2011/12 season. Home matches are played at the Stade La Mosson, named after the area where it is located, with a capacity of 31,250. It was built in 1998.